Hello This is Elena and I have one more scrapbook layout to share today. I like to look through the photographs I have made several years ago and pick some of the best ones to use for my scrapbook pages. 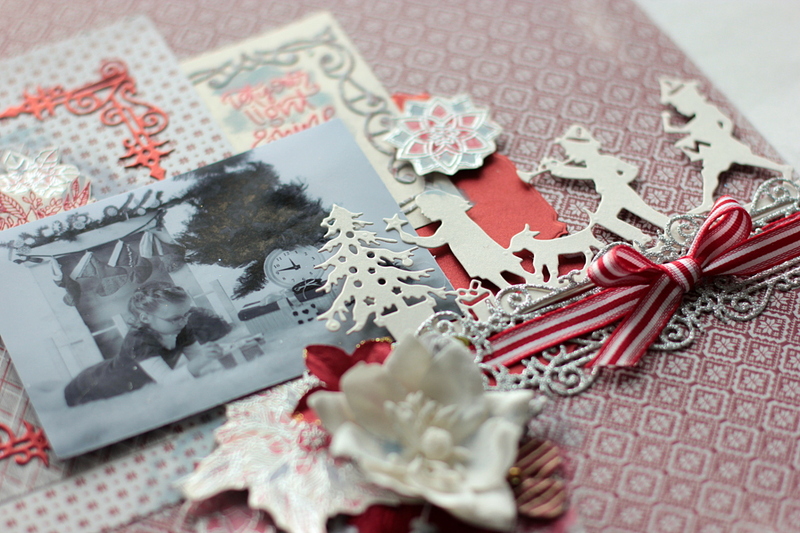 For my Layout I started with the Presents die by Sharyn Sowell. I really love the collections with the silhouette she creates. I die-cut kids silhouettes from pearlescent white cardstock. I also wanted to maintain the idea of giftwrapping so I added the Strip of Swirls die cut that I cut out of silver glitter cardstock. I complemented it with a stripped ribbon, that I pulled through the die cut and made a bow on top. Then I focused on the frame. I like adding frames to my layouts, they help to create layers around the photo and always add sophisticated look to them. I die-cut a large frame from A2 Swirls Frame set and layered it a behind of my photo. 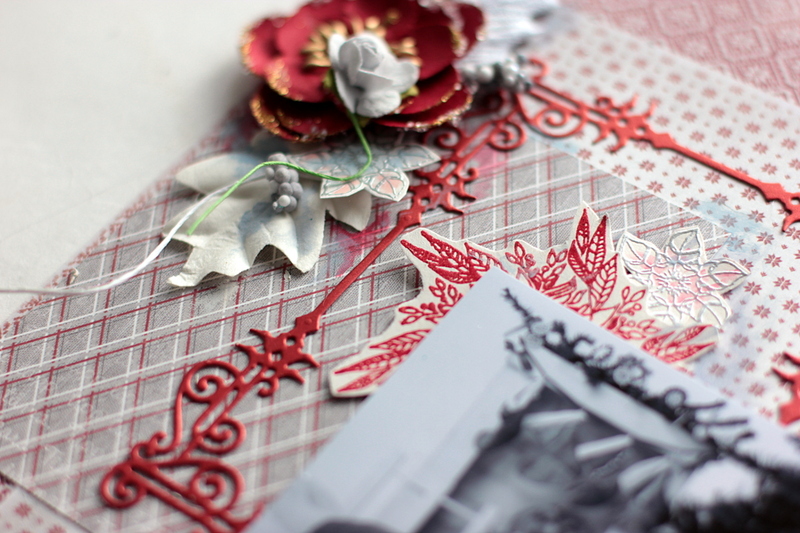 This time I also wanted to create a few embellishments for my project. So I stamped several images using stamps from the Cool Vibes collection by Stephanie Low – Mandals Set and the wreath from Light Shine set, that I heat embossed in silver and red embossing powders and colored slightly with watercolors. Using the same Light Shine Set I heat embossed a title my Layout and put it in a little frame made using Swirls Frame set. I had some much fun making this layout and enjoyed coloring and layering. I love die cuts! I find one and I think it’s my favorite and then I see another beautiful one and then it’s my favorite. I love the dies of the marching kids. 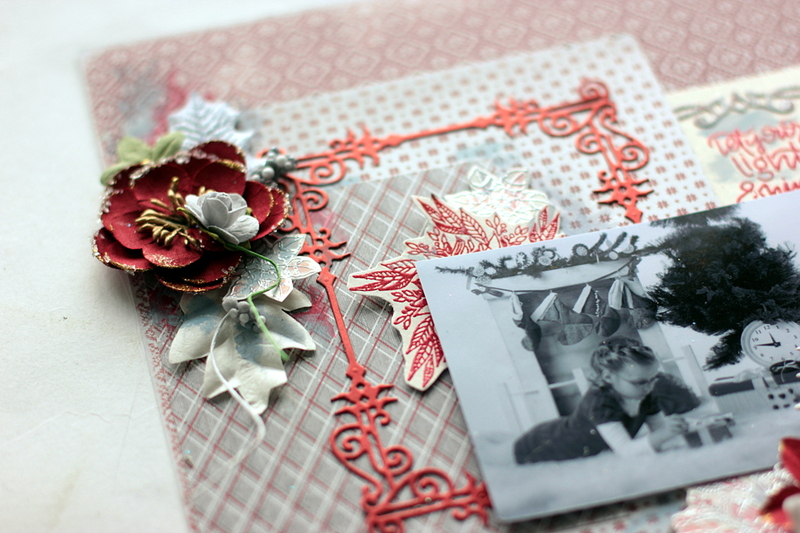 Also all of the beautiful lacy frames and strips. I love the fine designation. Also love anythingwith flowers! I don’t think I could ever have enough! 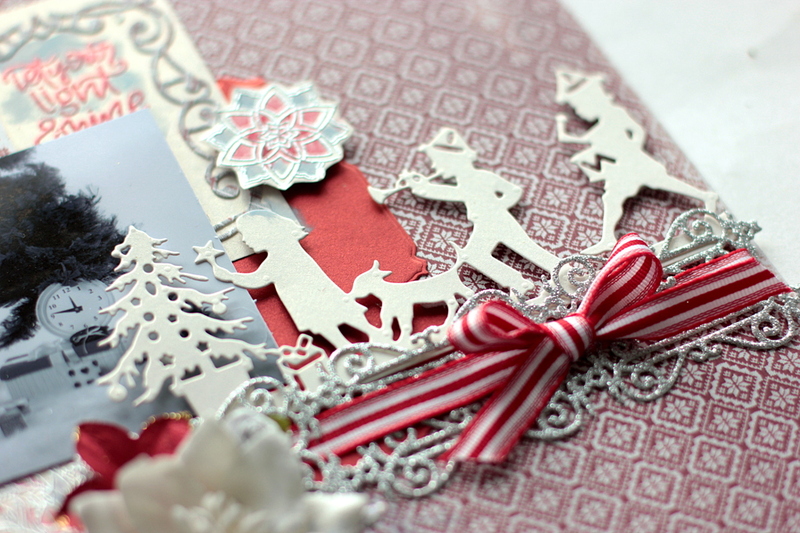 Love Spellbinders! I am definitely with you,Shari, I am Spellbinders obsessed as I feel that each time I need a new die , especially when I see that someone has used it in a new way. I can only hope to be this good at making cards. Love this Lay Out is lovely… Thanks so much … The Dies are so sweet with the Children marching… Thanks so much for all your hard work. I love it! Such an adorable layout. 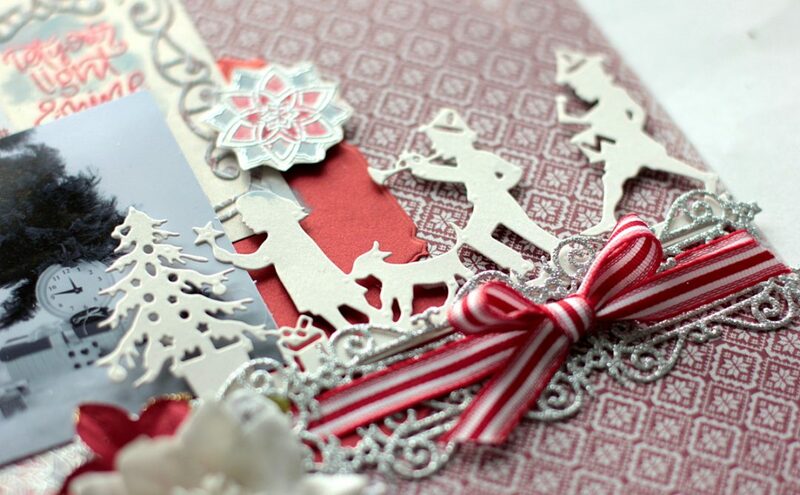 The color scheme brings candy canes to mind, and the children die-cut reminds me a bit of the Nutcracker. You are right, Katie, candy canes were before my eyes when I created the Layout.